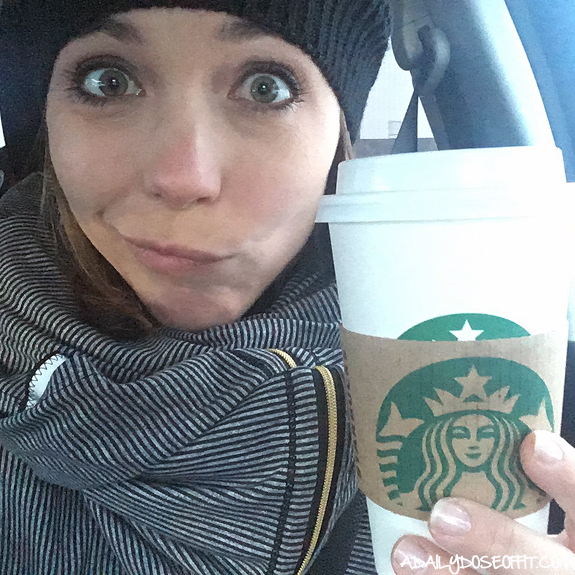 Wow, so it's been awhile since I've A) checked in, and B) shared a few things that I am loving. True testament to life and all that it's throwing at me right now. Needless to say, 2017 did not start slow. Case and point: February is right around the corner. So I'm taking a break from the mayhem to reflect on a few of the thing I am loving right now. Maybe you'll love them, too. My friends at POPSUGAR sent me another free box to review. But you should know, I would absolutely fork over my own money for this monthly subscription service. I am obsessed with everything they always send me. And on the off chance they send me something I can't use, I can usually find someone that will. For example, there's a peppermint tea in this month's box that I'll never drink (because coffee). But everything else, you know I'll use it. If you'd like to get a box for yourself (you totally should! 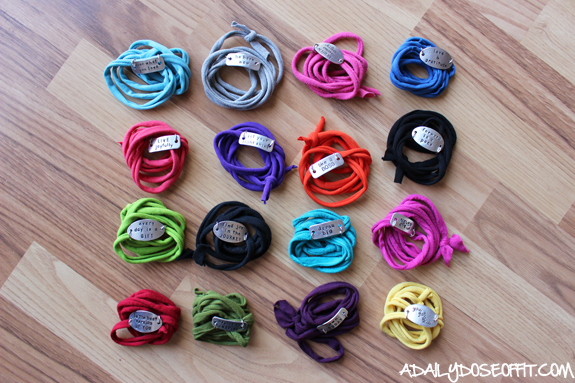 ), you can use SHOP5 at checkout to save $5. I promise you'll get your money's worth. This month's box adds up to about $200, but a monthly subscription costs $39/month. For real. It's literally a gratitude adventure in five minutes. They call it a "secret weapon to focus on the good in your life, become more mindful, and live with intention." You get one page every day, and it literally takes five minutes to fill out at the start and end of each day. You write down things that you are grateful for, things that would make your day great, and then you reflect on that at the end of the day. I feel like I've been in a skincare funk. I haven't been able to find a face soap or lotion that I like, so maybe that means my skin is changing? I've always thought it to be sensitive, and it's got a hint of redness to it that can totally be covered by makeup, so that's good. But still. I just want a soap that works. Currently, I'm using two. One is cream-based and I use it regularly. The other is this gentle scrub from Lush. It's not cheap, but it's worth it. My sister gave me a sample and one use convinced me to buy some. Plus, if you're not familiar with Lush, I'll tell you that almost all of the ingredients are natural and the products themselves are essentially homemade. My skin feels so soft and clean when I use this stuff. I probably use it three times a week. I'm headed to Chicago in a few weeks and I think I'm going to splurge on some face lotion from Lush since I'm having such good luck with the brand. Also, their Rose Jam body wash is to die for, too. Now, full disclosure, I get non-fat milk and only one pump of the syrup...but, dang. This latte tastes good because it's subtly sweet. I'm over the super sweet coffee concoctions. I go through phases with exercises. Right now, I'm in a plank phase. I was invited to participate in a fitness challenge at the gym, and it involved doing as many planks as possible each day. My longest plank so far was 25 minutes...and by "longest," I mean that I held 25 minutes of planks throughout one single day. Do planks, you'll notice a difference. I promise. In addition to the Wraps, Momentum also makes something they call a Sparklet. 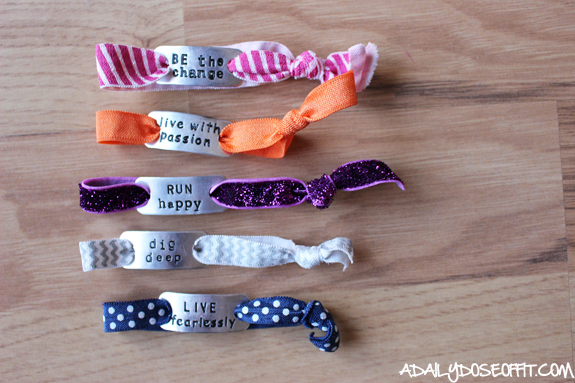 A smaller bracelet that's equally full of motivation. Question: What's one thing you are loving right now? The following post is sponsored by Hedstrom Fitness via my partnership with Fit Approach. I am also a Hedstrom Fitness ambassador. In addition to compensation, I was given free product to facilitate this review. All opinions are my own. 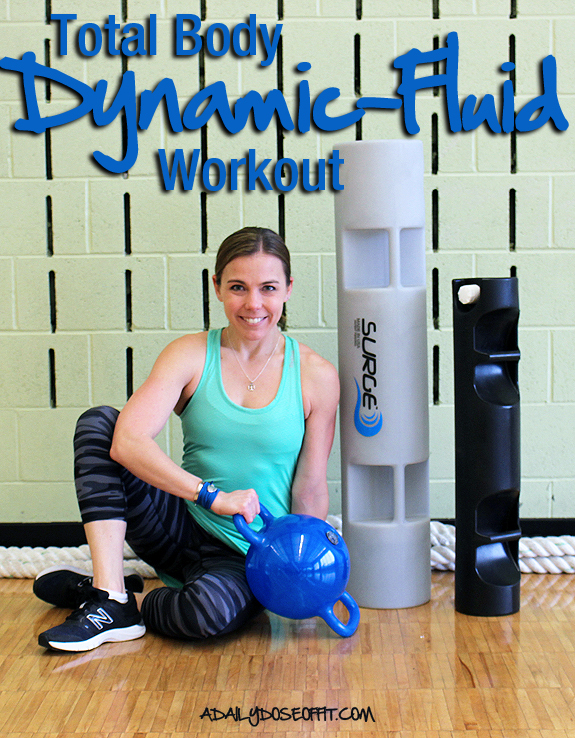 Last Friday, I introduced you to the concept of dynamic-fluid resistance training. There's another name for it: hydro-inertia training. 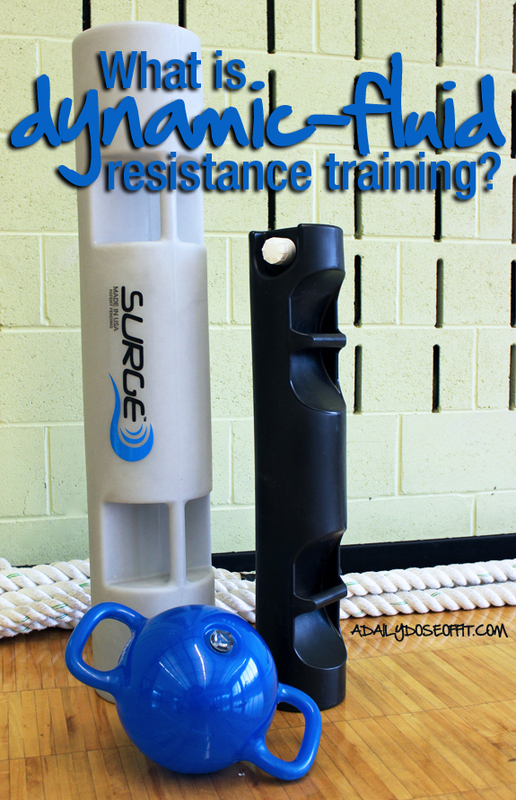 Long story short, this method of resistance training uses equipment that is filled with water. 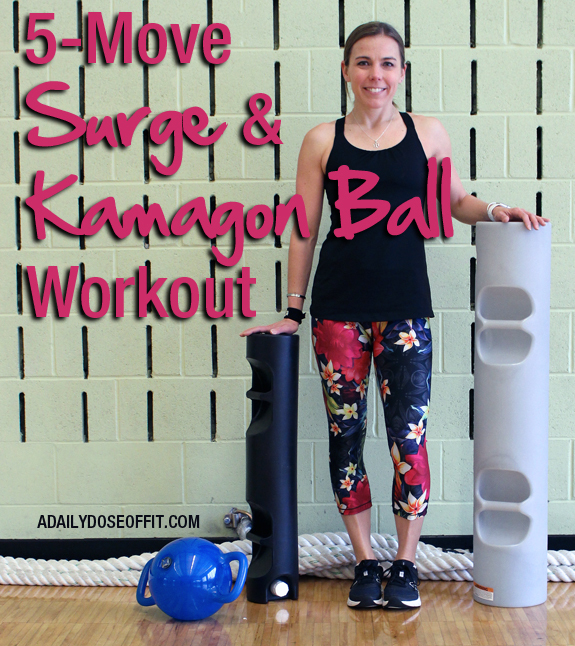 Specifically, the Surge and Kamagon Ball from Hedstrom Fitness. These two products are filled with water, which is constantly in motion when the products are in use. This allows the user to "train integrated, multi-joint, multi-planar movements to not only enhance appearance, but to also increase whole body coordination and neuromuscular compliance." Sounds like a good workout, right? Hedstrom Fitness is really on top of it with this one. 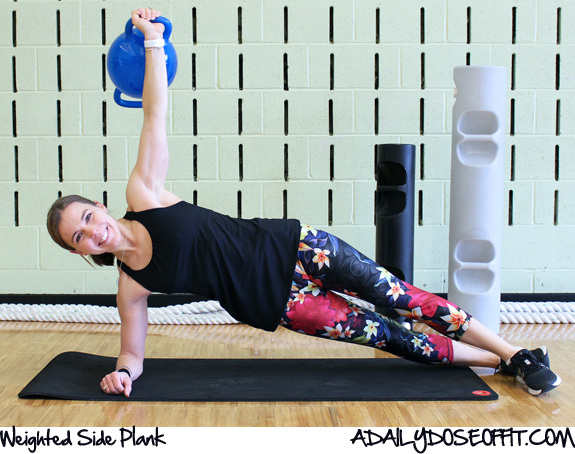 I put together a total-body dynamic-fluid resistance workout for you last week, and I've got another one this week. I'm really digging the Surge and Kamagon ball. In fact, I've taken this equipment to my gym and have been using both pieces all over the place. The feedback: "wow, this equipment is awesome." Because it is. If you don't have a Surge or Kamagon ball, you can get one HERE. Or, feel free to replace the following with a medicine ball, weighted bar or sandbag. It will remove the hydro-inertia element, but you will still feel the burn. It goes without saying, but I'll say it anyway: Please honor your body and work according to your fitness level. Before you try anything new, you should consult with a professional if you aren't sure such an exercise or program is right for you. Classic move. Even harder with a medicine ball...especially one that doesn't like to sit still. Another classic move. Alternate sides on each lunge. Harder than it looks! That water moving around...it makes it harder to control the Kamagon Ball. Be sure to get each arm. 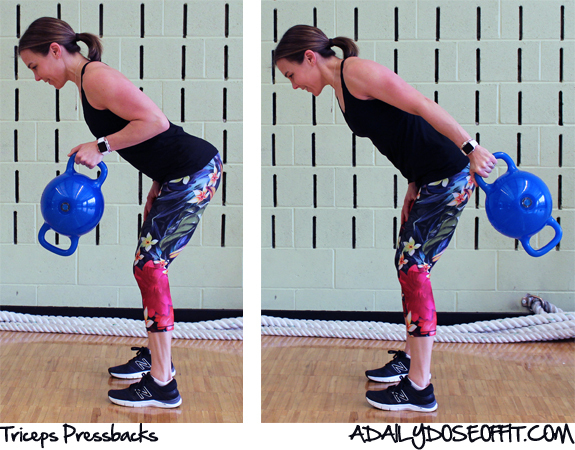 You can also change this one to an overhead triceps press, holding on to both handles at the same time. 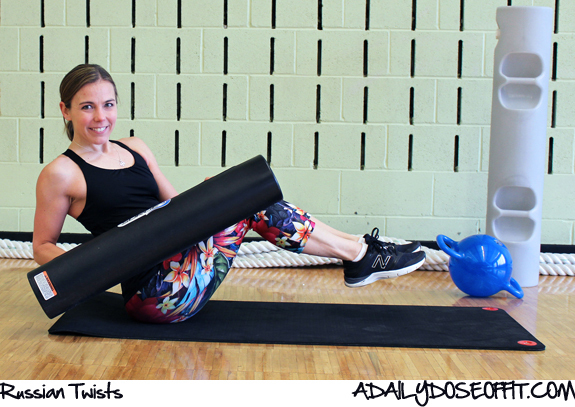 This core exercise is a total challenge! You can swap out the Surge for a Kamagon Ball if that's easier to hold. Keep your back straight and feet up, or place the feet on the floor to decrease the intensity. Rotate side to side, feel the burn. Hold that Kamagon Ball right above your shoulder! This can also be done with a straight base arm to increase the intensity. Be sure to get both sides! Do each move for (:45). Rest in between. Repeat the circuit 3-5 times, depending on time. In other words, make it a 30- to 45-minute workout. FYI: If you want a Surge or Kamagon Ball, you can save 20% with code SPHF25 at checkout. CLICK HERE to order. 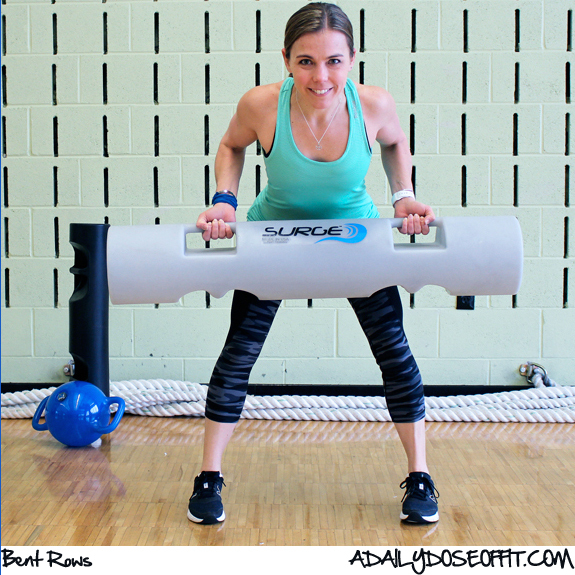 Question: What's your favorite piece of fitness equipment? Because, you know, they're basically toys for adults. So what do you like to play with? 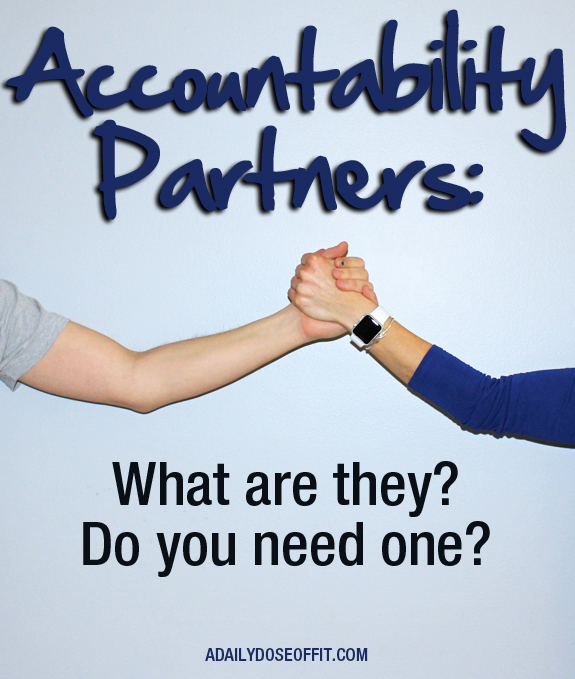 Accountability Partners: What are they? Do you need one? 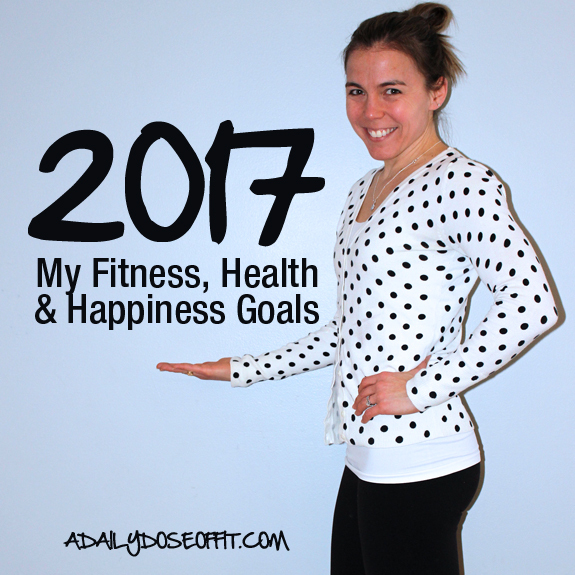 January is here, ringing in 2017 with a gust of snow and a list of new fitness, health and happiness goals otherwise known as resolutions. No matter what yours are, you will undoubtedly attack them with everything you’ve got. Right? Yes…but let’s be honest with each other. There will be moments when you falter or fail completely. So you need to get yourself an accountability partner. It's a friend. A counterpart. Someone you can trust, turn to and support in return. An accountability partner keeps you open, honest and moving toward your goals. When the going gets tough for you, your accountability partner sets in motion the motivation you need to get right back on track toward everything you are trying to achieve. You might think you have plenty of friends, a good spouse, maybe an excellent set of coworkers that you can always turn to in times of need. That’s great! They can be there for you—but an accountability partner is different. An accountability partner is someone you’ve trusted with your fitness, health and happiness goals. They are your point person. This is someone you turn to and say, “hey…I’m doing this, so please yell at me if I stop…let me check in, and definitely ask me how I’m doing.” And they will absolutely do all of that for you. And you, in return, might do the same for them. If you set very specific goals that you absolutely, without a doubt want to achieve, then the answer is very simple: Yes, you need an accountability partner. If you’ve tried to achieve these same goals already, but have have failed or faltered before achieving the end result you desire, then you need an accountability partner. If you don’t know how to achieve your goals, then you need a very specific type of accountability partner to guide you down the right path of success—but who is that person? Who can be your accountability partner? A personal trainer or group fitness instructor, if you have fitness goals. A registered dietitian or nutritionist, if you have weight loss goals. If your goals are a little less specific, maybe it’s someone shooting for the same moon and stars. Or, simply speaking, maybe it’s just that one person you know that will absolutely throw your excuses (all of them) out of the window. An accountability partner, above all, is someone you can trust. Someone you can turn to for help. Beyond a doubt, it should be someone who is really, really good at motivating you. Goals are meant to be achieved, and sometimes we need a little help achieving them. Take a look at your goals, then decide how you plan to achieve them. Choose an accountability partner—hey, you might even need a different person for each goal!—and let the magic happen. If I can help in any way: tara (at) adailydoseoffit (dot) com! The fitness industry is constantly changing, which is one of the reasons I love it so much. New studies are giving us fresh takes on health and wellness, while new and improved equipment is revolutionizing the way we train. Additionally, new trends are keeping us motivated to move. Hedstrom Fitness falls into all three of these categories, and they're doing it with some unique fitness equipment: The Surge and the Kamagon Ball, both of which embrace the concept of dynamic fluid resistance training. What is dynamic-fluid resistance training? 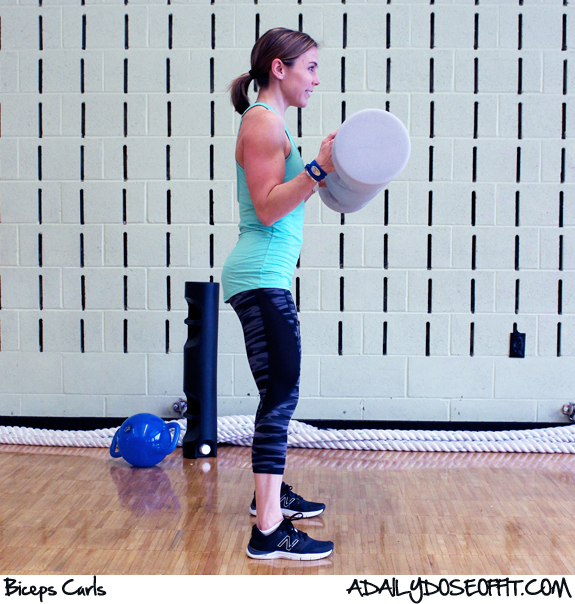 First, let's step back and discuss strength training in general. Think about machines and barbells with weight plates. One thing they share in common: Stability. I'm not saying this classic way of training is bad, not at all. But I am saying they don't always challenge your core as much as they could. You all know how important your core is, right? Center from which all movement originates? Yeah, next question. Make it harder. I know. You can definitely challenge yourself with machines and bars, but when you add dynamic-fluid resistance training—you'll fire up every last fiber of your core more than ever before. In fact, it's not just your core that will take the test. Dynamic-fluid resistance training changes the way your muscles respond to the task at hand. As in, they can never truly relax into an exercise because they have to stand alert to the ways in which the equipment will move—because, in essence, it will constantly be in motion. Dynamic-fluid resistance training is exactly as it sounds: Resistance training using water that moves. The Surge is a giant tube filled with water. The Kamagon is a medicine ball filled with water. And in both cases, the water inside is always moving around. Sand in a sandbag will eventually settle, but water physically cannot. Hedstrom Fitness harnessed this power in the Surge and the Kamagon, both of which create resistance via motion. Translation: This fitness equipment is hard to control, which makes for a really great workout. Before I get to the guts of the workout, please let me say this: Consult your physician before trying anything new, or if you have any questions about the appropriateness of the exercises or the equipment itself. Safety first. You know your body. Listen to and honor it. Two traditional moves combine to create one challenging exercise. As the water moves around inside the Surge, the intensity of the overhead press will increase twofold. Step back, twist, step together and repeat. Alternate as you go. Keep your core tight. Fight the moving water at all times to challenge your muscles AND protect your low back. One of my absolute favorite exercises! I love the way the Surge makes it feel completely different. Pay extra attention to the space between your shoulders. Fight to keep your spine straight! 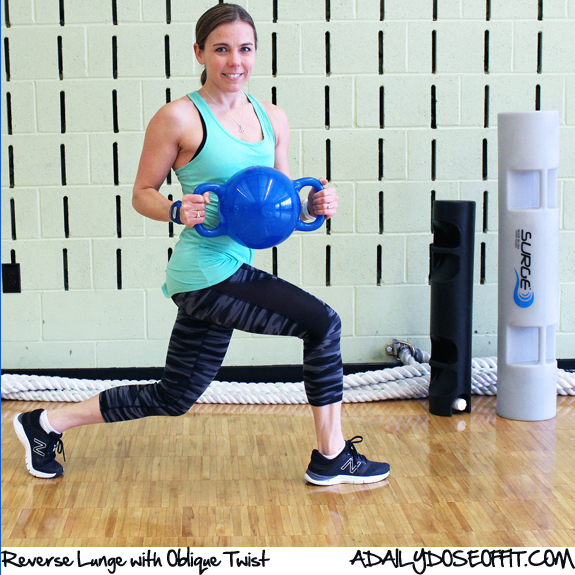 If this challenging core exercise isn't in your fitness routine, try moving one leg at a time. Either way, fight for good form as you lift and lower the Kamagon ball. 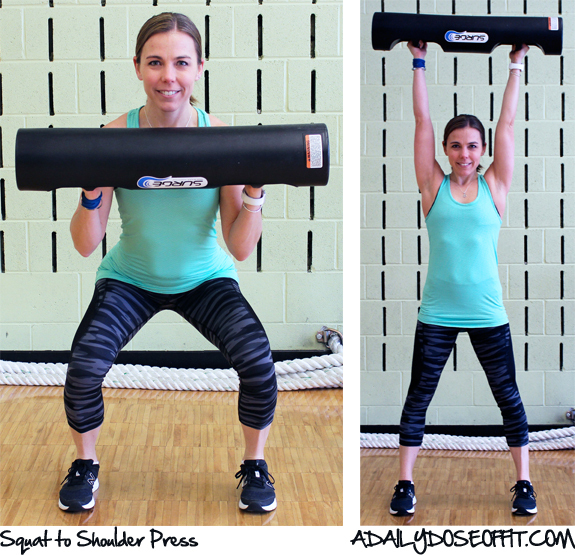 Another classic exercise that feels completely different with the Surge! If you use the bigger of the two surges, two different handle styles give you the option to perform regular biceps curls OR hammer-style biceps curls. Whatever works! Make note of the shifting water within. Fight to keep it steady! I know, I know...but what if you don't have a Surge or Kamagon? You can get one HERE. Use SPHF25 at checkout from January 20 thru February 28, 2017. You'll save 25%. Valid in the US and Canada. OR, if purchasing new equipment isn't in your budget right now, try the above with a body bar, medicine ball, hand weights or maybe even nothing at all! Be sure to follow me on Instagram, too. I'll be having some fun with the Surge and Kamagon, that's for sure! Check back next Friday for another workout! Question: What's your favorite piece of fitness equipment? Have any experience with dynamic-fluid resistance training? Here we are, seven days into 2017, and I finally feel ready to set some goals in place. I've been mulling over the months ahead, trying to decide how I want to live this year and what I want (or need) to accomplish, and I came up with the following. 1) Run a 22:00 or less 5K. As of right now, my 5K record is 22:05. That five seconds is killing me! So this year, I'm going to focus and push. I'm running a 5K later this month, but don't expect to meet this goal. I've been running, but not outside as much. Generally at this time of year, it's all about moving forward through the Winter. Come Spring, I'll reassess how to make this happen. 2) Attend IDEA World 2017 in Las Vegas. I went to BlogFest at IDEA World two years ago and absolutely fell in love with the event. I skipped a year because it's really hard to for me to get to California inexpensively. But IDEA is moving to Vegas this year, and that makes it much more accessible. I'll be going as a fitness professional, but hope to meet up with all the bloggers at BlogFest, too. Are you going? 3) Become an ACE Fitness Nutrition Specialist. I do a lot of continuing education to maintain my certification. Most recently, I got my ACE group fitness certification. And since I'll be doing some fitness based continuing education at IDEA, I figure that it's also time I focus on the nutrition aspect of my profession. 4) Host at least one team building event and/or social hour. As the fitness director at my gym, I am in charge of an incredibly talented group of fitness professionals. But, admittedly, we are so rarely in one place at the same time. You have no idea how hard it is to get everyone in one place at the same time! But I'm bound and determined to make this happen this year. I love my team, they do an awesome job. And I want them to really, truly know it. 1) Get my eyes checked. I put this on my list every year. But seriously, 2017 is going to be the year I finally get my eyes checked. I don't really have any issues with my vision, then again, maybe I just don't realize they exist. 2) Buy more locally grown fruits and vegetables. I can't really tackle this one until the Summer months hit, but I want to visit the farmer's market more often and, possibly, sign up for a CSA again. I did this a few years ago and truly enjoyed my weekly box of fresh deliciousness. 3) Curb the sugar (possibly the coffee?) addiction. I make no promises about the coffee, none at all, but I do need to look at my sugar intake. Know of any good resources on this topic? Like, perhaps, a good book? See #1 below. 4) Find a way to focus on my mental health...start a journal? When I'm stressed, holy cow. Just leave me alone. Wife, mother, fitness director, personal trainer, group fitness instructor...I wear all of these hats every single day and it wears me down. It makes me forget about that other hat I wear, too. The one that says "me" on it. I need to find a way to wear that hat underneath all the others, all the time. My physical health is spot on, but dang...my mental health game gets fuzzy sometimes. I need an outlet, a way to clear my brain of all the fuzz. A blank journal does me no good. I've tried that. Is there something out there that works for you? A guided daily journal that keeps you sane? Let me know. 1) Finish at least one book every month. I absolutely love to read, but can probably count on one hand the number of books I read in 2016. So I'm vowing to read more this year. I am currently reading "The Trespasser" by Tana French. What should I read next? 2) Avoid mindless use of the iPhone. I fall asleep flipping through my phone when I could be reading. Or talking to my husband. I pull my phone out of my purse while we're driving to the grocery store to answer a text, then I end up surfing Facebook because why not. This needs to stop. For real. 3) Spend more time saying "yes" and doing things in the moment. "Wait a minute," and "hold on," and "maybe tomorrow" come out of my mouth a lot. I talk about doing something someday, and then I never do it. So this year, I'm going to make like Nike and just do it (whatever "it" is). Because why not? 4) Do one thing for myself every month. Aside from my fitness schedule, I don't do much for me. And when I do, I always feel like I have to ask permission, even though I don't. It's the whole "mom guilt" thing, and it's dumb. If I need some time alone, I should take it. If there's something I really want to do, and it's within reason, I should do it. Right? So I'm going to work on that. I'm going to do one thing every month just for me. A race, a manicure. A weekend with my college friends. One thing, and I won't feel guilty about it. This month's "one thing" is going to be that 5K I mentioned earlier. So I'm off to a great start! Question: What books should I read this year? 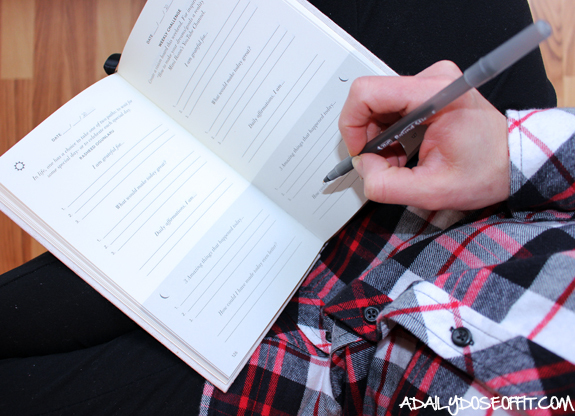 Do you use a guided journal? If so, which one?